100 Years ago the Great War entered its final few months. Victory was close. But for who? And at what cost? The world would never be the same again. The social landscape of Britain altered forever. Using songs, readings, poetry and drama, even humour, Theatre Workshop Coulsdon explores this final year of tears and revolution, and looks beyond to see the impact that this bloody clash of empires made on the century that followed. And exhibition on the First World War and the fallen soldiers of Coulsdon, curated by local researchers, will accompany the production. There was something quite poignant about entering the Coulsdon Community Centre on Barrie Close on the night after its destruction had been agreed by a committee at the Town Hall. After more than 80 years’ fine service, the centre is to make way for houses and flats. The people who will live in the new-builds won’t any longer have a venue to meet for Zumba classes, drop off their child at the playgroup, or listen to Field Marshal Montgomery speak about the perils of The Bomb, as the hero of El Alamein did with the Coulsdon Boys’ Club in 1946. 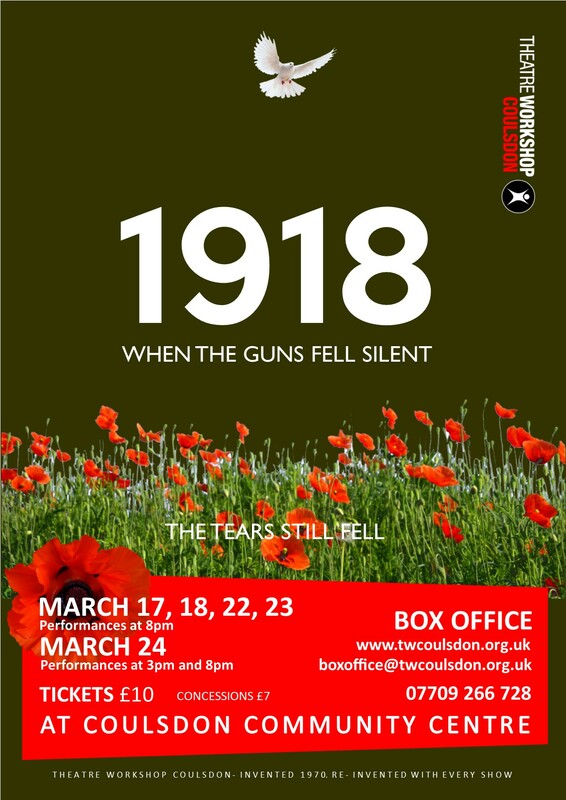 The place is steeped with history, and the producers of 1918: When The Guns Fell Silent have done a fine job of harnessing some of that feel of a bygone era as you arrived for Theatre Workshop Coulsdon’s latest production. Passing a blackboard with the date chalked upon it of the declaration of war – all thanks to some Archduke hardly anyone had heard of or cared much for before his assassination – the community hall’s walls are bedecked with some serious scholarship and historical research. Who knew that 40 members of the local running club, South London Harriers, joined up in those first weeks after war broke out in August 1914? Or that four of them died on the first day of the Battle of the Somme? It has been said before that those who ignore history have no future, so this piece, devised, written and performed by Coulsdon Theatre Workshop’s Paul Ford, Dawn Ford and Richard Lloyd and their talented team, ought to be a compulsory watch for all Croydon schools between now and November 11, the centenary of when the guns fell silent. The ensemble cast, performing a series of scenes, sketches, poetry readings and songs, make this an impressive and moving piece of work. A sub-title to the performance is “…The tears still fell”, and the way in which the selection of works are inter-woven, between the trenches and the home front, quickly draws in the audience as the end of the war that didn’t end all wars nears. The writers have drawn on sources as varied as Oh What A Lovely War, Ian Hislop and Siegfried Sassoon, but this is very much an original piece of work. Avoiding the Music Hall motif of OWALW was important; there’s little of the jingoism that was so common in the early days of the war in this play. After four years of trench slaughter, that had taken the troops from musketry training to a war of airplanes, tanks and poison gas, the overwhelming emotion delivered by the performers is the futility of war and the desire for it to be over. One strand that runs throughout is the terrible uncertainty for families, such as the mother of young Jack, who is allowed to sign up and is shipped off to Flanders despite being under-age. Drawn from original diaries from 1918, Lisa Lloyd’s treatment provides a spine for the whole performance which helps hold it all together. Particularly effective were the couple of counter-point scenes, where actors voiced the words of soldiers at the front, the similarities between them all so evident. Sitting around a camp fire, trying to make something worth eating, the poor bloody infantry, whether German or British, really had other priorities rather than killing one another, as their officers ordered. And the finale brought the audience home, to Coulsdon, and the role played during and after the war of Cane Hill, where hundreds of soldiers were treated for shell shock, what today we know as Post-Traumatic Stress Disorder. Inspired staging, sombre delivery and a real sense of local history being respected drew the admiration of the audience. It was as effective an end scene as anything which Joan Littlewood or Richard Attenborough devised 50 years ago. “No one won the war,” was the wise reply. The short run for this admirable piece of work ends today. A revival in the autumn, to help teach the next generation about their history, and their future, would be very welcome.